And all of this maiming and killing of these trusting intelligent horses, the most noble of sentient beings, took place in just ONE (1) WEEK? This is a totally unacceptable situation – an average of TWENTY-FIVE (25) DEATHS each week across the nation all in the name of human entertainment, $2 bets and pure greed. And this number of 25 is only the disclosed deaths, multiply that number by at least twice and one is closer to the true number of deaths. And let’s not forget the vast number that suffer horrific inhumane journeys to the slaughterhouse where they suffer the ultimate betrayal, a terrifyingly cruel death! These innocent horses cannot defend themselves and are at the mercy of the creepy humans who do what they damn well like to them – the drugging, the 23 hours a day confinement, the whipping, the electrical devices, being forced to workout and race when sore and/or carrying pre-existing injuries, inhumane living conditions, inadequate veterinary care, often insufficient nourishment, the list of these animals’ sufferings is endless. When are these lunatics (they couldn’t possibly be mentally okay) in the racing industry going to wake up to the fact that horseracing has lost its social licence! Well said Carolyn – right on! These racehorses are slaves for profit, and inflated rich egos. When they are not victims of these 2, then they become victims of a person who can’t afford to house/feed themselves, but have this grandiose delusion that they can make money off of them. They are used, abused, and then dumped when no longer profitable or doesn’t satisfy a rich owners ego by competing at the highest levels. In other words, most racehorses have a career span of 3 years, and after that they become a disposable commodity. They are merely numbers, filling races for wagering revenues. This is the sad life of a racehorse. 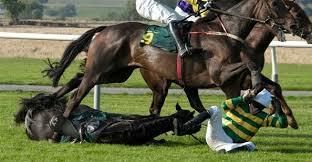 This is the part of horse racing that they don’t want you to know. Incidentally, I was watching Houston Animal Cops on Animal Planet the other day, and they did a huge raid on a defunct horse racing farm. It was just about as horrific as it gets. I couldn’t say that the horses were skin and bones because there was no skin – just bones. Two had already died right on the spot. The others required thousands of dollars of vet work to get them back. This farm went into not only the racing end, but the breeding end of it as well. Again, an irresponsible breeder for this despicable industry. Two of the mares were in foal. One was lost – one was saved. The animal cop said, during the program, that they are seizing an unprecedented amount of racehorses from farms in Texas. Even he said that the industry needs to shut down. They also said that the economic costs of rescuing these horses are rarely recouped. So if they are not victims during their racing careers they are victims from the get-go for an industry that shouldn’t exist in modern day society. Yes Carolyn – they have lost their social license. Further, the people participating, and supporting this cruelty circus, and death camp have lost their minds. I call it a delusion. They call it passion. Whatever you call it horses are dying in the dirt for $2 bets. This blog provides the Killed In Action lists which are despicable in and of itself. However, there are thousands of more racehorse victims, called broodmares, who are virtual breeding machines for their heartless owners. Take for example, STORMY BEND. A 23 year old mare. Yes folks – I said 23 year old mare that is in foal once again. She’s had life threatening complications in the past years, but they still keep putting her in foal. These are heartless people who have no brains. Are you kidding me? These people are living in LaLa land and the horses are paying the price. For it’s entire life cycle these horses are slaves to money and egos. Yes Gina…regarding Stormy Bend and other broodmares like her…you see these people PRAYING that things go well for mare and foal and I want to say “Then STOP! !” But that would affect their bank account to not have another life to sell, so they just keep breeding her year after year after year…these poor beings in the industry NEVER have a life of their own. And WE’RE the crazy ones? ?